Cultural and creative industries (CCIs) represent highly innovative SMEs and their promotion can effectively increase regional competiveness and job creation capacity. For participating regions CCIs represent a strategic sector of development as underlined in many of their RIS3 documents. Despite the dynamic and innovative field of action, CCIs encounter difficulties in access to credit and lack resources to enhance their competitiveness on the global market, build effective partnerships and extend their activity to other countries. 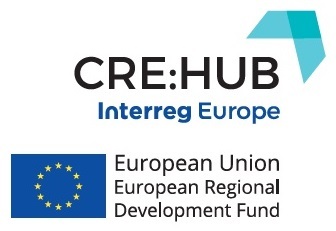 CRE:HUB overall objective is to improve 8 programs for Investment for Growth and Jobs (TO3)to support creation and development of new SMEs in CC sector at regional and national level, thanks to fruitful cooperation among regions with different level of capacities and experiences in CCIs supporting policies. CRE:HUB will concretely result in improvements of the management of policy instruments addressed (way to organize calls, select projects; coordination among regional policy instruments at regional/interregional level; new methodology for monitoring/evaluating policies), in implementation of new projects and in change of some OPs addressed.policy changes will be tailored to meet specific CCIs needs (partnership creation, collaborations with different productive sectors, internationalization, entrepreneurial capacities, access to credit, etc.). CRE:HUB outputs are oriented to Managing Authorities of Investment for Growth and Jobs programs and the whole regional CCIs policy and productive systems will benefit from them. Main CRE:HUB outputs are: CCIs regional/SWOT analysis; analysis of main regional experiences and lessons learnt; road maps to integrate lessons learnt; study visits; working sessions of policy stakeholder groups; on-field evaluations/peer reviews of CCIs regional policy systems; common system of monitoring and evaluation of CCI policies; action plans to implement policy changes; policy recommendations; inter regional events.